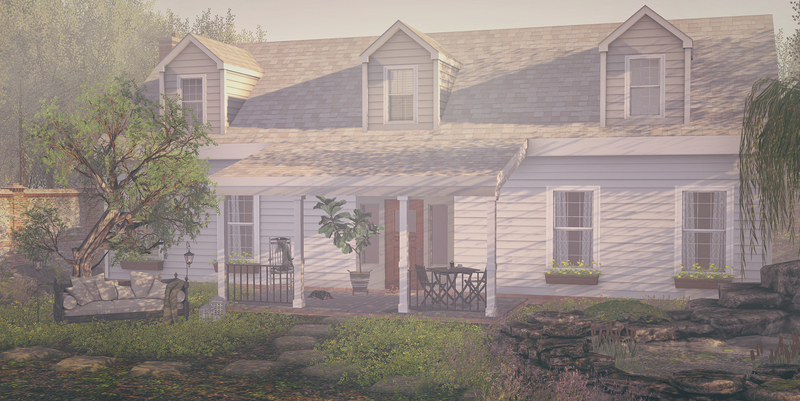 I’ve had many a conversation over the years about a need for a home in Second Life. For me, it’s a must. I’ve used the phrase ‘displaced’ about how I feel when I’m in between homes. I’m more unsettled, anxious, skittish and generally less at ease with everything else in my Second Life if I don’t have a home, set up and decorated. it’s more than just the place you set home to for logging in purposes. So yes, I’m a blogger. I am constantly on a platform, putting together new scenes and homes like this one today. Sometimes when I’m doing it and it comes together, like today, I feel a pang at the thought of taking it down again to build the next one. It hits you ‘I could live here….no, I WANT to live here’. That is reinforced when Zedekiah logs in while I’m working on a scene like he did yesterday and comes and looks at what I’m doing. I could totally see us sat on the porch drinking coffee in the morning or sharing an evening drink curled up on that rocking chair. I can see us playing with the dog while sprawled on the garden sofa, or feeding the koi in the pond. That’s when you know a scene is coming to life for you and becoming the difference between a home and where I log in.